Most Arizona property owners need to replace their roofing system at some point. A roof is exposed to the sun’s damaging UV rays, monsoon rains, winds, haboobs, and hail. Conventional asphalt shingle roofs may last 20 years in Arizona, and that’s if you are lucky. If you care about the environment, (and who doesn’t) consider using eco-friendly roofing materials, even if they cost a little more, they will also last longer. Some of the things that make the roofing systems we will discuss here echo–friendly are their energy efficiency, and longevity. There are green, eco-friendly roofing materials that offer energy efficiency, long life span, and require exceptionally low maintenance. If you are looking for an Arizona roofing system that will outlast conventional asphalt shingles, and is considered eco-friendly, here are three possibilities. We will discuss foam roofing, metal roofing, and PVC, single-ply membrane roofing. Recently we have been hearing a lot about cool roofs, also known as white roofs. These cool roofs are made of a light and often reflective material. By reflecting the sun’s rays back away from the building, rather than absorbing the heat like conventional asphalt shingles, a roof can lower the cooling cost of a building by a great deal, and even help keep the surrounding area cooler. When it comes to energy savings, no one can beat spray foam roofing! During colder months, foam roofing insulates your structure by keeping the heat inside where it belongs, not allowing it to escape through the roof. Throughout the intense heat of an Arizona summer, white foam roofing, with its reflective coating, reflects the sun’s rays away from your building, so the heat cannot enter. Spray foam roofing can help you save up to 70% in energy costs, while the government and energy suppliers may offer rebates to encourage consumers to conserve energy. The energy savings of a light reflecting, insulating, spray foam roofing system will pay for your new roof in an amazingly short time. Often just a few years! Although spray polyurethane foam roofing has been around for nearly 50 years, its popularity has exploded over the last decade due to its numerous benefits. For starters, it is a solid, uniform, one piece roofing system with no seams to leak. In addition, since spray foam roofing goes on as a liquid that quickly hardens, it conforms to, and perfectly seals around vents pipes, flashing, and skylights, etc. It has an inexhaustible lifespan when periodically re-coated by a foam roofing company. If a foam roofing system does sustain any damage, foam roof repair is quick and easy when performed by an Arizona foam roofing company. Spray foam roofing is also considered sustainable, since when properly maintained, it will last the life span of your building. These roofs are durable and flame resistant. One last echo-friendly tidbit, the blowing agent used in applying spray foam roofing does not contain any chlorofluorocarbons to harm the atmosphere. Another type of energy efficient cool roofing system is a white, PVC, single-ply membrane covering for a flat roof. A PVC membrane flat roofing system is long lasting and energy efficient. Since they are white, they will reflect, rather than absorb the heat of the Arizona sun. The seams are carefully fused for water tightness. We often think of metal roofing materials as being suitable for barns and more rustic buildings in a country setting. Today, metal roofs are quickly gaining in popularity as people are becoming more energy conscious. Metal roofs can be made from steel, aluminum, or copper. A metal roof has a long life span, can help reduce cooling costs, and can be recycled. The lighter color you choose, the greater the energy savings will be. In addition, metal roofs do not absorb heat, and can be coated with a reflective coating in order to reflect the sun’s rays. They are also fire retardant. One more eco-friendly point is that metal roofs are ideal for harvesting rainwater. Many people enjoy the softness a rainwater rinse gives to their hair, and reduce their water bill by using rainwater in their gardens. At 1st Class Foam Roofing & Coating, LLC foam roofing company we care deeply about the environment, both for today and for generations to come. Spray polyurethane foam roofing has exceptional insulating qualities and is a form of energy efficient green construction. Spray polyurethane foam roofing eliminates waste, as there is no need to tear off the old roof and the new foam roof will last the lifetime of your structure. Foam roofing requires little maintenance and should it sustain a puncture, it can be easily sealed with Phoenix foam roof repair. Our elastomeric cool roof reflective coatings contain acrylic, which is commonly found in water based house paint. This coating is extremely flexible to prevent cracking. It is low VOC, and within a few days of curing it becomes 100% inert. Applying spray foam roofing requires skill and training, so it is best left to experienced technicians at a spray foam roofing company. 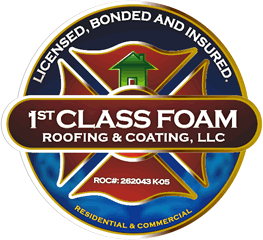 If you would like a free roof evaluation on an echo friendly foam roofing system, call the experts at 1st Class Foam Roofing & Coating, LLC.